It's that time of year... new planner time! I love all these 17 month planners that start in August (for back to school season I guess!) and go through December of the following year. I always feel so pressured to pick the perfect planner since it's going to be my buddy for the next year or so. Rifle Paper Co makes the cutest damn everything. They have an adorable line of planners, stationery, and office accessories. My only gripe is the inside pages of their planners are kinda blah. If you're into minimalism, that may be a selling point for you. Personally, I want whimsy on every page. Bando agendas are pretty much the coolest planners in town. They come with some stickers and have really hip art all throughout the inside pages. Last year, I used a classic sized one for about six months before switching to my bullet journal. The inside pages are STUNNING. I've been pretty into my bullet journal for organization and planning, but wanted to get a fancy planner for journaling and memory keeping. I'll be filling my new planner with scrapbookish diary pages instead of to-do lists and appointments. 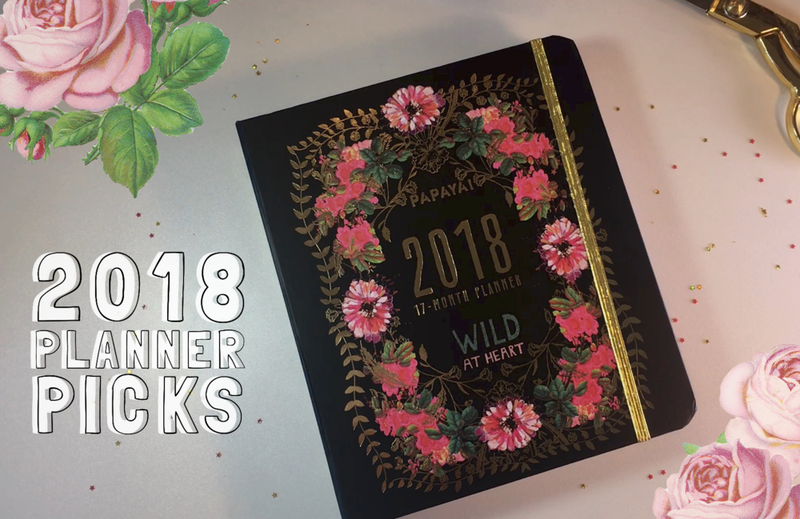 In my latest YouTube video, I've done a little flip through so you all can see how gorgeous the inside of the Papaya Art planner pages are. (So many florals and gold foil accents!) You'll also get to see the few weeks of August that I've journaled so far. This is a chatty video. I usually just do a time lapse replay of my planning with music playing. For this one, I recorded narration with some more info about the planner, my process, and some life snippets. I'm happy with how this one came out and I feel like I'm getting more comfortable with video creation. Hope you enjoy. Do you have a favorite planner line I might not know about? Please do share in the comments!